the six years of World War II. At the start of the year it interest in television was such that many manufacturers were weeks behind on deliveries, the shortage being such that many models that had been loaned to the press for demonstration purposes were recalled. At the same time, it was reported that the Television Advisory Comitte had come to the conculsion that there was nothing to stop teh television service being expanded north to Birmingham and Manchester (a television-capable cable had been laid as far as Birmingham several years previously). On the night of the 23rd February, the B.B.C. televised the Great Britain Lightweight Championship "Boon vs Danahar" boxing match from the Harringay Arena. This was a double first as not only was it the first occasion that the B.B.C. had been permitted to televise a big fight but also the first time a B.B.C. 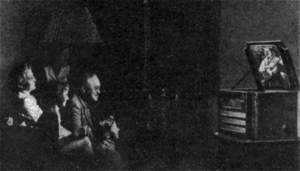 transmission had been shown to a paying audience at a cinema. Baird projection equipment had been installed at the Marble Arch Pavillion and the Tatlar News Theatre. This involved the use of equipment using a hige 16-inch projection tube running at 45,000 volts, producing light levels comparable to that of normal films. 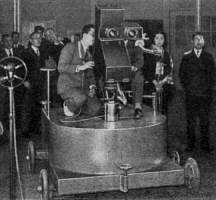 Each projection unit contained two projection tubes, one acting as a backup in case the first one failed. The B.B.C. were, however, keen to point out that this did not mean that subsequent B.B.C. programming would be available at such venues, stating "It must not be taken that any general extension of permission for the rediffusion of B.B.C. television programmes in places of public entertainment is contemplated". In February, the high class store Selfridges in the West End of London staged a television exhibition that ran for seven weeks. It included its own television studio, allowing visitors to see the actual live performance and compare it to the performance as seen on a television set. a Ferranti (left) and H.M.V. (second from left). 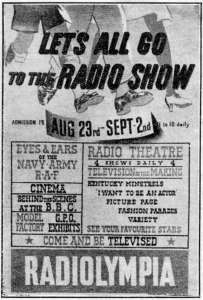 The Radio Show opened on the 23rd August. 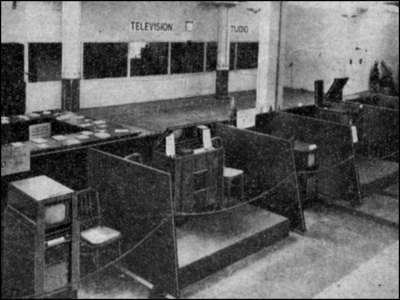 Television was starting to take off, and the year's Radiolympia was promising to give "...the greatest demonstration of television the world has ever seen", with 64 televisions displayed in the special "Television Avenue" and, it was claimed, literally hundreds of sets on manufacturer's stands receiving continuously throughout the exhibition. 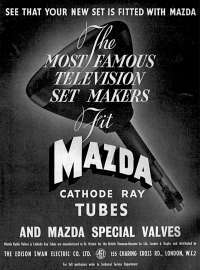 Many manufacturers, both existing and those new to television, were displaying new models. 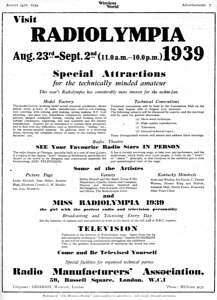 But Radiolympia was abruptly closed on the 1st September, when the television transmitters were switched off at the outbreak of World War 2. Ceasation of transmitions were sudden and largely unexpected ; a report on a RMA Television convention [pdf,179k] held towards the end of August had been full of confidence (particularly from Pye's characteristically outspoken chairman Mr. C. O. Stanley) in the prospect of growing receiver sales and the extension of the television service into the provinces. Many manufacturers were showing new television models at the show. HMV introduced four new receivers that clearly showed the improvements being made in CRT development ; the largest console previously only had a 9-inch screen and their 12-inch model was a mirror lid design. However the new models used 10-inch and 14-inch direct-view screens, with one table model and three consoles. A few of these sets were to re-appear after the war, for example E.M.I. 's HMV1800 model re-appeared as the HMV1804 and it's Marconiphone version, the VT50A. However E.M.I. did not use 14-inch C.R.T after the war and it seems a small manufacturer, Haynes, made use of the stocks of this C.R.T. that remained. Cossor showed one set using a 13½-inch C.R.T. which was masked such that the actual picture was no larger than that of a typical 12-inch model. The idea behind this was to provide a flatter picture area, though it has to be said that the Cossor C.R.T.s seemed to have had a particularly bulbous bulb compared to their rivals. At the start of the year, Mullard introduce a valve specifically developed with television in mind. The Mullard EE50 utilised a secondary emission effect to greatly increase it's gain whilst retaining good high frequency performance, replacing the TSP4 secondary emission valve type that had seen service in a few earlier television sets. But, unfortunately, it was difficult in practice to actually design a circuit that made full use of the gain available and the EE50 saw little, if any, use. But Mullard did better with their next valve, the EF50. Released not too long before the outbreak of war it had, like the EE50, been developed with television in mind. It even made it into at least one pre-war television, the Pye model 12C that was shown at the year's Radiolympia in August. Whilst the outbreak of the war put the EF50's television career on hold, the valve was ideally suited to the new radar technology and has even been referred to as the valve that one the war. After the war it resumed its television career, being used in a number of televisions up until the start of the 1950s. 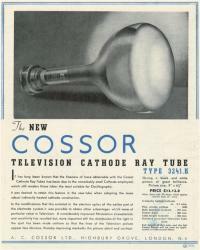 One other noteworthy valve, introduced in mid-1939, was the Cossor 4TP. 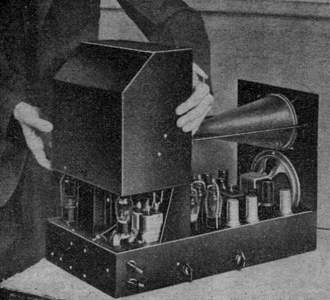 Whilst multiple-valves-in-one-glass were already established, they had until now been intended for radio, either as a mixer/oscillator or as an audio demodulator and amplifier. However the 4TP was specifically intended for television. 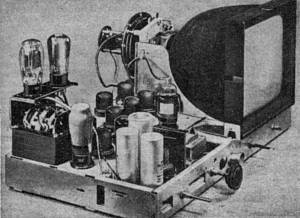 It consisted of a triode plus pentode and was specifically intended for use in television timebases. Post war it was not until almost the start of the 50's that such multi-valve types were would become mainstream. Pre-war (and indeed early post war C.R.T. 's) were quite fragile and quite frankly dangerous as they could implode and shower shards of glass over quite a distance. 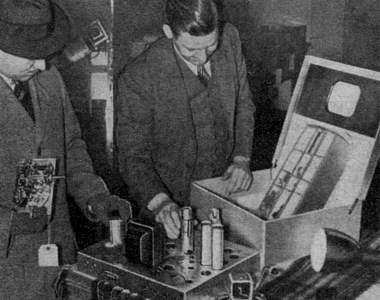 In mid-1939 the Radio Manufacturers Association (the 'R.M.A.') recommended that manufacturers fitted a protective heat-treated safety glass over the C.R.T. 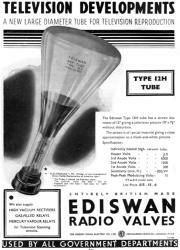 For tubes of 16-inch and over the glass should be greater than 3/8ths inch thick with 1/4 inch being considered satisfactory C.R.T. 's between 9 and 16 inches, with 3/16-inch being adequate for C.R.T. 's less than 9 inches. The year also sees the introduction of the CRM92 and CRM121 C.R.T.s manufactured by Mazda. These C.R.T.s went on to be used in a number of post war television models although their reliability was, in hindsight, relatively poor. In the middle of the year, Odean Theatres placed an order with Scophony to equip their 60 London cinemas with televsion receiving apparatus. Changing the subject completely, here's todays quiz : the director of Scophony, Mr. Oscar Deutsch, was also the chairman of which group of theatres ? Andrea Radio Corporation release what was claimed to be the first television kit in the U.S.A. (which seemed to overlook a kit released by Garod teh previous year!). Claiming that it can be built by the "average man" in under 30 hours, the kit did not include a cabinet except for a part of a front panel through which the 5-inch C.R.T. could be viewed. It was, however, also available as a complete ready-made television. The Andrea was very quickly followed by a kit from Meissner. Although there was no need yet for multi-channel televisions, Meissner were looking ahead and this set could be switched between two channels and also a further two blank switch positions to allow a further two channels to be accomodated..
At the Berlin Radio Exhibition (late July / early August) there was only one television on show - the "Standard Television Receiver", designed by the five main German T.V. manufacturers. It was the first receiever production T.V. in the world that utilised a flat-faced rectangular C.R.T. and produced a picture of 22.5x19.5 cm (~8¾x7½ inches) - slightly larger than that produce on a standard 9" British C.R.T. Whilst being available to the general public at a cost equivalent to roughly £50, Germany still had no regular T.V. broadcasts despite having two transmitters. But transmissions must have been imminent as it was forcast that some 5000 sets would be produced before the end of the year. However most if not all German manufactures continued to develop larger models for marketting when permitted. 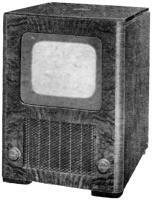 In particular, Fernseh developed a television with a flat-ended C.R.T. giving a picture just over 12x10-inch (31.5x27.5cm) yet measuring only around 16-inches (42cm) long ; compare this with the British Cossor 1210 which gave a similar sized picture yet the C.R.T. was almost twice that depth. normal valve shown for scale. Fernseh were also developing a new projection CRT and reflector for home use. A German 441-line system was installed in Rome in readiness for opening of tv service. demonstrated in a laboratory in Kinuta-cho. In the first half of the year the Broadcasting Corporation of Japan, Nippon Hoso Kyokai, were transmitting from and experimental station and were nearing completion of a new station, including studios, in Tokyo. They had chosen the same picturedefinition as America - 441-lines interlaced, but operating at 25 pictures per second whereas America used 30 pictures per second. Apparently the system used a new type of camera tube, known as a Tecoscope which was claimed to be ideally suited to outside broadcasts. Related Links : 1) The Early Television Foundation. A museum and many other resources connected with pre-war television for both America and Europe.